Motorsports Village • View topic - Spragless Converter? This is that Trans Specialties verter I bought from a guy in Florida and had it sent directly to BTE. I had them cut it open, make it spragless and make the stall about 500 RPM more than the previous verter they did for me that I ran up until I pulled the engine out of the Camaro. Well, that verter is in this dragster and I'm not sure how it's suppose to act since I've never owned a spragless verter before? During a run the engine flashes to around 6600 off the 5500 two step then the MSD Digital 7 makes the gear change @ 7500 RPM, the engine only drops back to 7000 RPM and it finishes the eight mile up around 7680 RPM? So that 4:56 rear gear seems to be doing exactly what I wanted but I NEVER feel the gear change? Not sure if it's spinning the tire then or what as that doesn't show up on the engine RPM graph and my drive shaft sensor isn't working so I can't tell there either but something just doesn't feel right? So does a spragless verter feel any different from a regular one? Next, I've read where spragless verters will kill some MPH down track? Is this true and how much loss is usually experienced with one? Post subject: Re: Spragless Converter? I can feel mine shift, 3,300 # door car..I was also told mph would not be noticed in the 1/8 mile?? Mine did not change..Your mileage may vary though..
We run one. Kind of hard to tell because we went from 3500 to 5000 so improvements all around. I think the key is consistency. Was having a conversation with Don Kowalsky this afternoon about the gear change thingie and it occurred to me that with the 1:69 planetary in that thing, the fall back RPM is going to be less, and it is. The data logger shows that it only looses 500 RPM at the gear change, ie, shift at 7500 and it falls back to 7000 after the gear change. 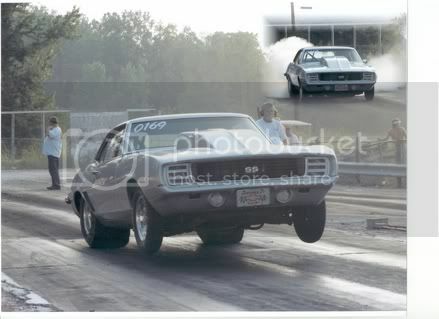 So Don says that his car (door car) usually drops around 1500 RPM at the gear change but he's running a 1:80 planetary. So now I'm wondering if this is what this thing is suppose to do and or how it's suppose to feel? Shicks is running one of these 1:69s in his Nova so I've got a call in to him to talk about this. Maybe he can shed some light on what's going on with my car. Ken I just check my rpm drop at the shift and it's a solid 1000 rpm..Now I have a diod in this converter and it stalls at 6200. Yeah Barry, that's another thing. I haven't turned off the two step to see where this converter stalls at but I can tell ya that at the hit it goes to 6600 then drops to about 6400 before it starts climbing toward the gear change. At the gear change it's at 7500 then it falls to 7000 and finishes the eight mile at 7783 RPM. That would likely be OK with it on gas but I need to get the trap RPM down a little for methanol. So this means that when I buy tires next spring I'll likely put a set of 33.5s on it to get another inch of roll out. That should kill a couple of hundred RPM at the stripe. You need to start planning to move to Virginia before the shooting starts! That and we could definitely get more done on these cars if you were closer. Oh, and there is some land for sale near me! Well I've got 6 full passes on this converter now and I'm getting more use to how it does. I was thinking that it was too loose but now I'm not so sure of that. As Randy355 has said in the past "loose is fast" and I proved that with the converter deal and the Studebaker a couple of years back so now I think I'm just going to run it like it is. Yesterday I noticed that the flash RPM went up a bit, probably from the engine making more power from the jet change. Then I had moved the gear change up from 7500 to 7600 and I noticed that the finish line RPM had gone up as well, and, it was running faster too. So it's shifting at 7600 and it's a little over 7700 in the lights and I'm going to call that good for now. spragless will feel softer on shift and decell ....less gear , less weight/roll resistance too. are you sure your not driving through the converter .what is calculated slip.that will defiantly. give you all your symptoms. so your still showing a slip in trans/converter of 15%? thats a ton of heat and your loosing that much h/p to it . neal chance did our blower and turbo converter and got them well into single digits . a quick test is to drain converter and trans and fill with a dual sump non hygroscopic hydrolic oil . the turbo car was at 12% and was burning redline syth. t/fluid in 15 passes ..it lowered temps and stayed clean and dropped to 9% ..
when we got the new converters from him they were much lower 6% -8%.and he told us never to use reg. atf again . said the h/fluids and compressor oils he recommends have a much safer flash point and dont sheer at psi . I'm ahead of ya on this one Bubba.